Pretty Little Bottles shares with us her kitty inspired manicure. Something Creative shows us her Union Jack caviar nails. Phyrra teaches us how to care for colored hair. 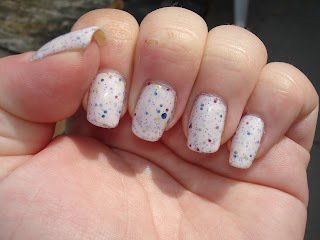 feedkmayeorchids shares with us her Alice in Neonland manicure. Polish Obsession swatches Nfu Oh 53. Make-up/Music/Money/Me shares with us her love of spring through poetry and nail polish. Gotham Polish shows us her manicure inspired by her SwellMayde Neon Envelope Clutch. Makeup Withdrawal teaches us how to create gradient nails using a sponge. The Lacquered Lady shows us her Game of Thrones inspired manicure. MoreThanJazzz shares with us her recent NOTDs. Manicure Description: I picked up a six pack of mirco beads from Michaels so I could try my hand at the "kaviar manicure". This was my result! I used Essie Splash of Grenadine and pink mirco beads on my middle and pinky nails. Favorite Polishes: I love Cult Nails Clairvoyant (that i won in a contest that Maria held), Lynnderella Connect the Dots (I don't have it but I want REALLY bad lol), OPI Teenage Dream, OPI Bubblebath, Julep Alicia, Sofia & Leah, Essie Marshmallow, OPI, Skull & Crossbones, and anything purple! the jawbreaker manicure looks awesome! This really makes me want Splash of Grenadine! Such a cute mani! Wow! A caviar mani I actually like. Very pretty! Love Jawbreaker!